Simply look young at any age! to look young at any age! 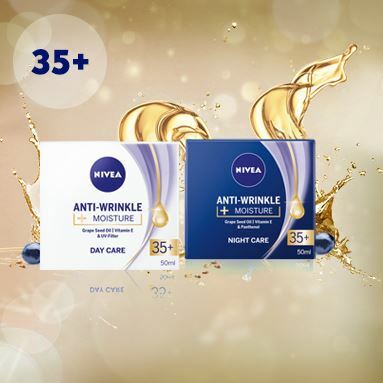 The new NIVEA range offers high quality, affordable skin care for women aged 35+, 45+ and 55+ who are looking for an efficient anti-wrinkle solution. In order to enjoy beautiful skin for a long time, we need to listen to the needs of our skin and provide it with proper care, adjusted to our age. This is why the New NIVEA Anti-Wrinkle Plus creams have effective formulas based on just 3 active ingredients tailored to what our skin needs in each stage of maturity. After 35 years, we start noticing first mimic wrinkles around the eyes, mouth and forehead. Collagen decreases, leading to dryness, lack of smoothness and glow. Anti-wrinkle care should focus on hydration. Grape seed oil, in combination with Vitamin E, keeps the skin supple and smooth. After 45 years, the metabolism slows down and the skin visibly loses its firmness. This is why our skin needs ingredients like apricot kernel oil and macadamia oil which smoothen the skin and improve its firmness, as well as a balanced mix of UV filters that keep it safe from the sun. After 55 years, the level of oestrogen is reduced and so is the skin’s capability for regeneration. 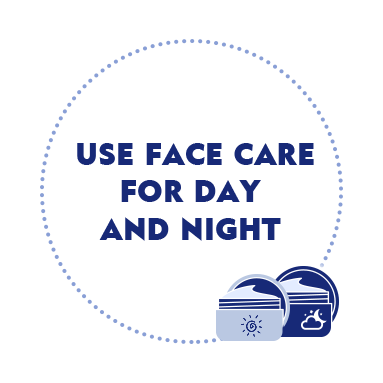 This is why anti-wrinkle face care should primarily revitalise and intensively nourish the skin. Argan oil, avocado oil and calcium are ideal ingredients for the skin in need of nourishment. Our experts dedicate their knowledge, time and passion in finding the effective anti-wrinkle formulas that work best for you. 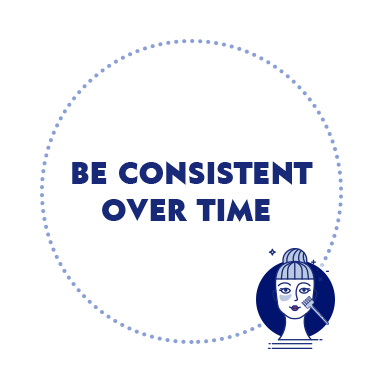 Their answers are here to guide you in creating your simple strategy for long-lasting beauty. After our 30th birthday, we start noticing first expression lines, as we squint and tense up approximately 15.000 times a day. At the same time our tolerance to stress is reduced, and decreased levels of collagen in the skin results in dryness, lack of smoothness and glow. Further, after 40 years, many new skin problems appear: fixed mimic wrinkles, nasolabial furrows, loss of skin firmness, and "sagging" facial oval. And finally, after the age of 50, the oestrogen levels decrease, and the structure and appearance of the skin changes. The corneal layer becomes thicker, and the remaining epidermal and subepidermal layers get thinner. With reduced blood supply, the skin receives less nutrients. It loses elasticity, becomes rough, dry and sensitive to external factors. 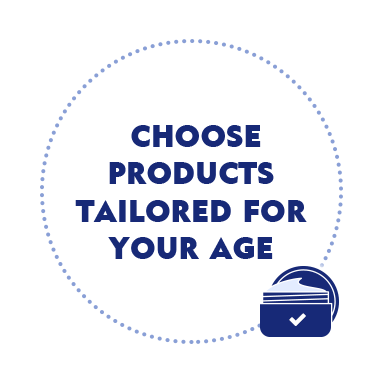 Why do I need different ingredients for different ages? Because the structure of our skin changes, and it gradually loses the natural functions that keep it supple and smooth. In the first stage of anti-wrinkle care, we should focus on supplementing the loss of collagen, with a formula based on intensive hydration doubled by effective anti-age ingredients. In the second stage, when the skin tends to “sag”, our priority in anti-wrinkle care should be enhancing its firmness. And in the final stage, where the skin can no longer receive all the nutrients in needs to regenerate daily, the focus should be on revitalising it with an intensively nourishing formula. What is the formula recommended for women over 35? At this time of life, the skin needs smoothing the mimic wrinkles and intense hydration, so the most valuable ingredients are grape seed oil, which provides strong protection and deep hydration of the skin, vitamin E, a natural antioxidant, which effectively prevents photoageing, has regenerative properties and maintains proper moisturisation, and UV filters. Over night, the skin needs ingredients like panthenol, which supports the process of skin regeneration, as well as optimises its ability to absorb and bind water in the corneal layer of the epidermis. What is the formula recommended for women over 45? At 45 years, the ideal skin care should provide firmness and wrinkle-smoothing effect. A day cream with apricot kernel oil, which demonstrates a strong firming effect, shea butter, to enhance the natural protective barrier and hydration, and UV filters. And a night cream with a highly nutritious macadamia oil and panthenol. What is the formula recommended for women over 55? An effective formula specially developed for this age should provide what the skin needs most at this time of life: smoothing of the visible wrinkles, and revitalisation. A day cream with argan oil, which slows down the skinageing process, calcium and UV filters. And a night cream with avocado oil, which effectively restores the skin protective barrier, damaged by time, and panthenol, which strongly supports the night regeneration processes. What are other simple changes I can make to look young at any age? Stress, malaise, lack of sleep, bad diet – the older we get, the more our bad habits influence our appearance. The change should start now. Healthy diet, exercise and carefully selected cosmetic products are the recipe for well-being and beautiful body, regardless of age. The sooner we start taking proper care of ourselves, the less effort it will require to get back in shape in the future. One day cream and one night cream are all you need to look young at any age. 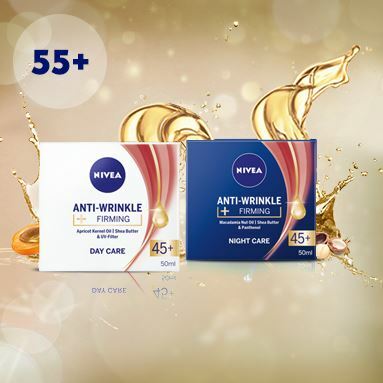 Choose the products for your age from our range of NIVEA Anti-Wrinkle Plus for 35+, 45+ and 55+.